i have been getting a LOT of questions lately regarding my supplementation, specifically related to pre- and intra- workout. for about 3 years now i have been using SHREDZ brand products to serve my pre-workout and intra-workout needs. i know, the name sounds super aggressive. that being said, my only qualm to date with the products i currently use is that the BCAAs are sweetened with sucralose. if i ever find a brand i love more that uses stevia or monk fruit i'll totally convert, but for now i am in love with these 3 products! as always, consult a healthcare professional before beginning any supplementation. this write up is simply a reflection of what i currently use and enjoy. I take this 30 days on and 30 days off. that means i take it for every workout for 30 workouts, and then i will workout without it for the same amount of time. this is recommended by the company, and i don't necessarily count workouts, but i'll do about a month on and a month off, repeated. I mix a scoop of this into water for every workout in my blender bottle! i love this stuff, it's so yummy. i always get the fruit punch, i'm sure the lemonade flavor is good but i haven't tried it. BCAAs are branch chain amino acids, and they're key because they are building blocks of protein. they feed your muscles during your workouts and aid in muscle recovery when you drink them after workouts as well. 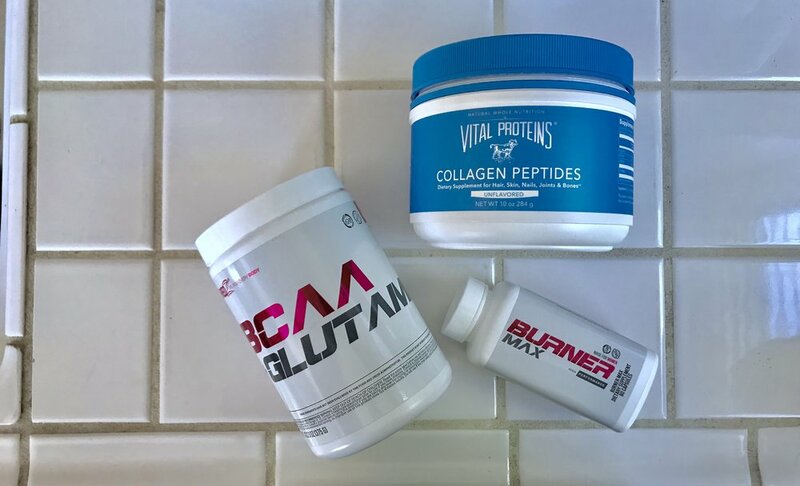 i love this collagen protein because it serves as a protein source and doubles are hair, skin and and nail support! i also love it because it is flavorless. this is KEY because you can mix it into anything, including coffee and smoothies. i mix this in with my BCAAS and drink it intra workout when i lift weights, and lately have been carrying a small container of the protein powder to mix into water post-workout when i know i won't be able to eat soon after. this is super helpful as your muscles need protein within 30-45 (maximum) minutes post-workout to start an optimal recovery process.